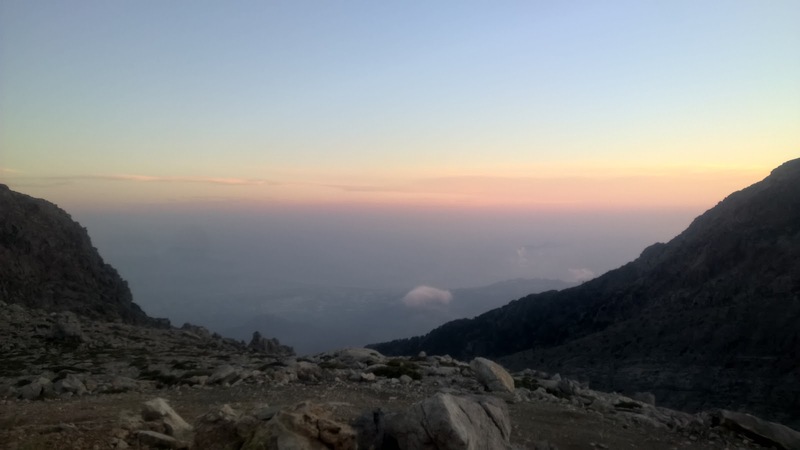 I had to climb Mt Psiloritis, Crete’s highest mountain, and that’s how this started. The mountain scramble is a key plot point in my current novel (with the working title of Follow the Goat. or Saved by the Bell :) The film pitch is: “Slopes, dope, love, goats: a slow romance at high speed through Crete” (all open for comment :). On a clear day from the summit of this sacred peak - thousands of pilgrims make the ascent each August - you can see all the furthest points of Crete: north, south, east and west. In my novel my two reluctant protagonists, on the run from the bad guys, chance upon a guide leading a tourist up to the summit by moonlight - but then lose them and have to find their way down, with help from the shepherds and, of course, a goat. If in doubt in the mountains, watch what the goats do. They are really smart. 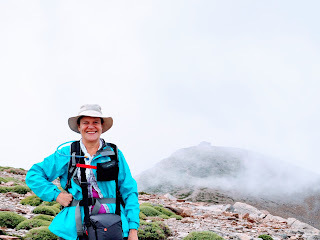 Eleni from Greentour, Crete, a local ecotourism operator, responded with the kind of warmth and enthusiasm that I had come to expect from Cretans. I had been the recipient of wonderful generosity and hospitality in my 1980 travels as a young Australian backpacker. I could have an overnight stay with the shepherds, she offered, to see how they make those wonderful cheeses. 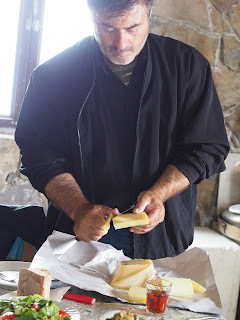 Cheese, olives, mountains, wild herbs, stone shepherd’s huts, goats. This was the starting point. But just a fraction of what was to come in three packed days of scrambling around the mountains and the verdant Amari valley, with its chapels, springs and village fountains, orchards, oak forests and memorable characters, some of whom are still living lives barely changed over the centuries. 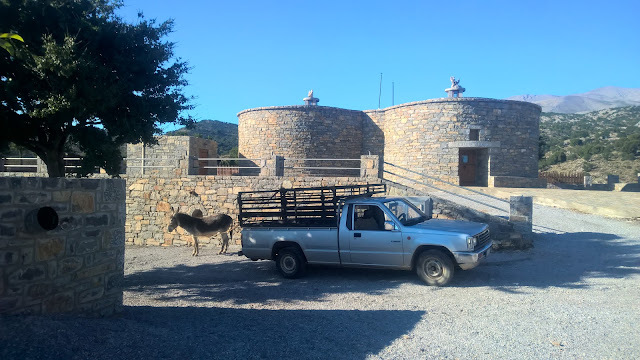 We drive up from Rethymno to meet Giorgis, the shepherd of shepherds in this region, and a thoughtful, gracious representative for their concerns. At Lochria we change vehicle and Giorgis takes us high, high up along treacherous mountain paths that have been degraded by recent rains. ‘The weather is very unstable,’ I am told. 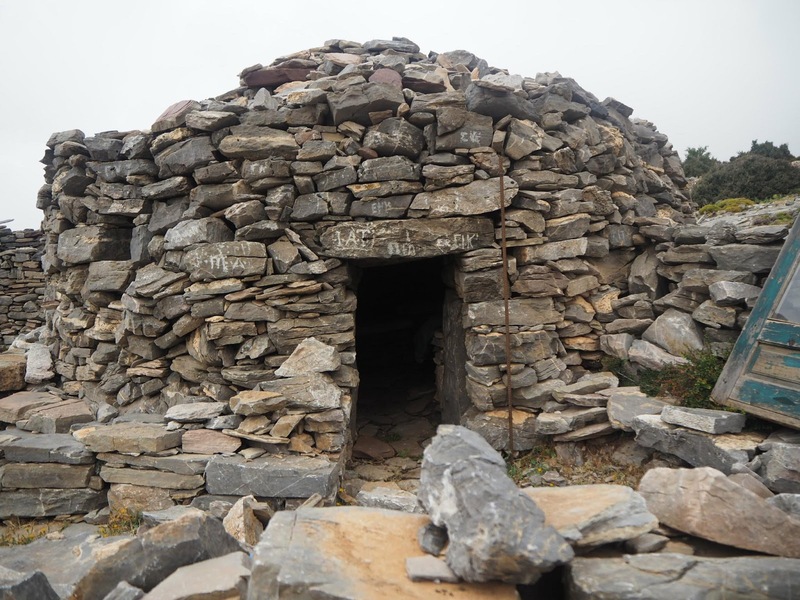 We see no one on the road, only goats and sheep, but pass ancient mitata, crumbling remains of the igloo shaped huts that are still used to store cheeses and for shelter. Some of the sheep, Giorgis tells us, belong to his brother – he seems to recognise them. The vegetation is bare and stunted: rocks, stones, wind curved olives and low lying clumps of prickle bush. Giorgis holds up a dried clump as a bouquet and makes a joke that I understand despite my non-existent Greek. We see a grouse and, up in the skies, many gryphon vultures, who play an important part in the eco-chain by cleaning up dead animal carcasses. 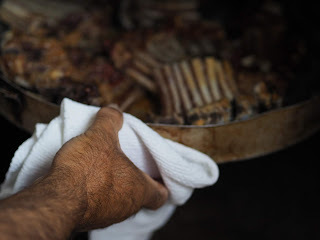 We arrive at a simple shelter where Giorgis occupies himself immediately with the wood stove – there is a slow cooked lamb to prepare for tonight, and it is quite chilly. We look directly out to the bare ranges, though fog seeps through the gap, obscuring the view 1700 metres below to the sea. The soft sound of bells rings clearly through. We see the flock crawling across the grey, scratched face of the slope; like white suds rolling towards a drain. 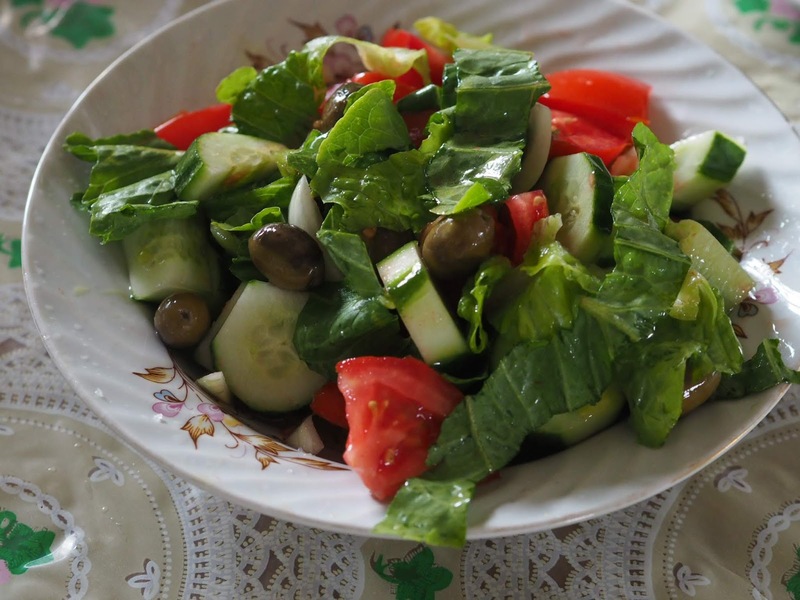 Eleni has made cheese pies with mint, white mushrooms with an ouzo flavoured batter and she is now assembling a green salad, chopping red luscious tomatoes and offering around salty shrivelled olives that she has prepared herself. We consider the weather. It is not likely that we will be able to access Psiloritis from this southern side tomorrow. We will decide in the morning. 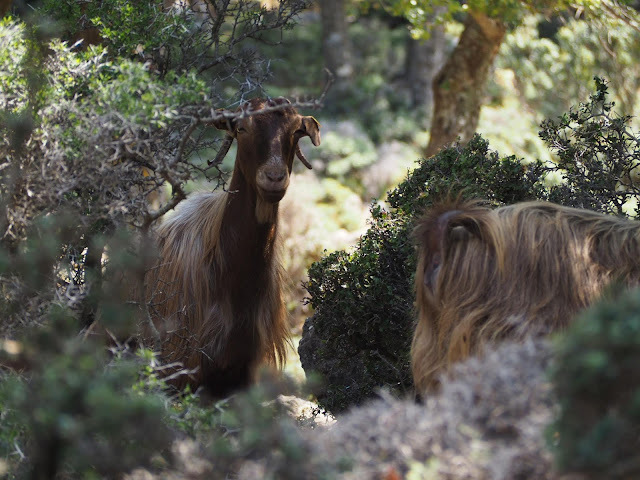 Giorgis has to lure back some goats who have strayed, so we don rain jackets and head out, passing by the springs where we fill up on thyme scented mountain water. 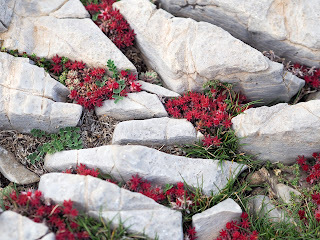 There is a mantinada at the spring - a rhyming couplet, very Cretan, engraved in stone. 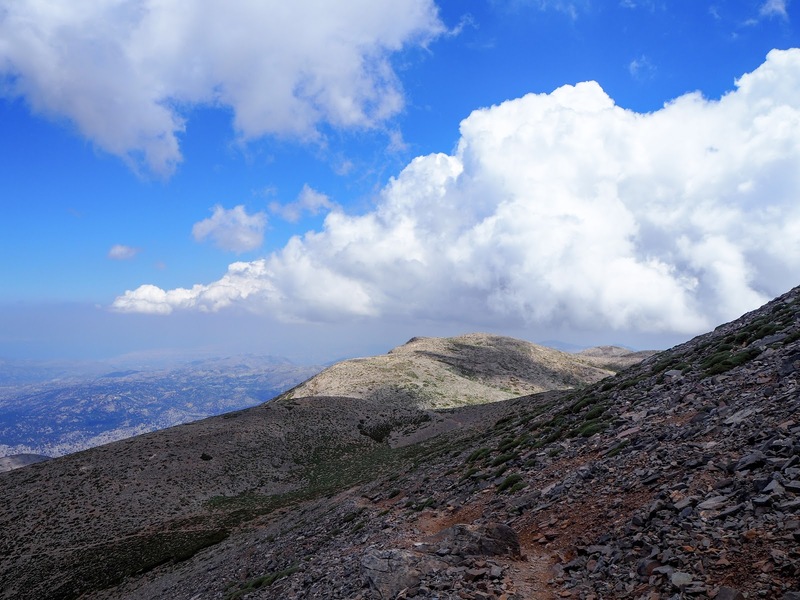 Eleni translates: Cold water, gift of the god to old Psiloritis, the highest of peaks over all of Crete. We do a bit of goat clambering ourselves. Giorgis sprinkles corn seeds to attract them back, explaining that if they find food in this location, they will return. For a moment I wonder where he has disappeared to around the craggy rockface – but he turns up, smiling, the lines of his face and his grizzled grey beard perfectly blended into the landscape. He shows me a piece of rock that has a kind of etched pattern – maybe a kind of faint fossil, but it looks like a Japanese ink painting. He gives it to me – “for my office”. 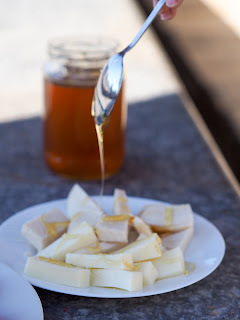 We return to the shelter for a siesta and Eleni makes me a mountain tea (dictamos) with honey, enjoyed since Minoan times and good for digestion and healing. Back to dinner preparations; there are potato chips to be cooked in olive oil and the lamb ribs to check. The feast is laid out and consumed with gusto, accompanied by homemade wine. We should pay a visit to the neighbouring shepherds, Eleni suggests, and prepares some items to take to them; coffee supplies, whisky (the Famous Grouse brand), and some other basics. On the way Giorgis drives up an almost impassable track and stops to point out that the Ideaaon Andron or Zeus’s cave (baby Zeus of mythical fame was supposed to have been raised here) is over the other side. He knows the cave is another important setting point for the novel – my two protagonists have to take refuge here. 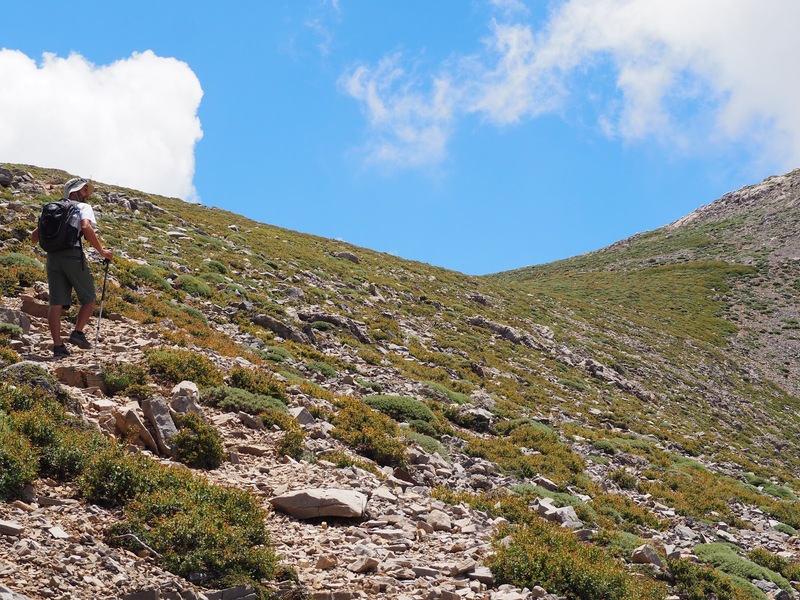 We retrace our tracks to visit the shepherds – Kostas and Irini and their two granddaughters, staying for the school holidays. 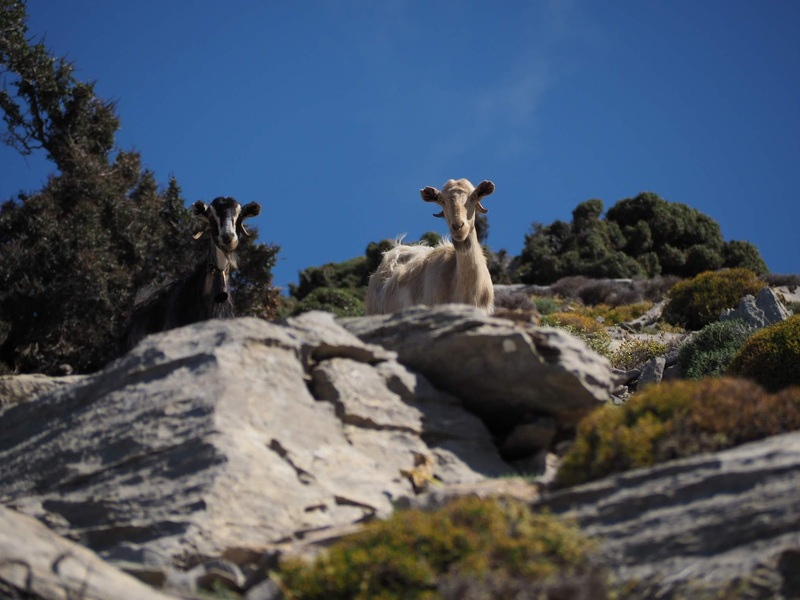 Outside their shelter the flock of sheep wait patiently, down from the mountains and penned so Kostas can keep an eye on them – a little wary of ‘rustling’ in these parts. We enter the dwelling, having to stoop low under the door frame. Inside there are five people and two fires, one of which heats a huge cauldron of milk that is becoming cheese – Irini stops stirring to greet us and to prepare cubes of graviera and other cheese varieties of varying coulours and consistencies, as well as some sesame coated sweet treats. 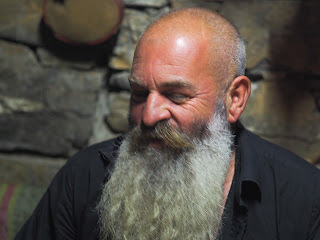 Kostas has one of the longest beards I have seen and ruddy smooth cheeks. He is most pleased to see Giorgis, as he has many matters to discuss. The two girls squeal with delight at seeing Eleni and regard me with curiosity – I have my camera which gives me something to do while everyone sinks into excited chatter. Kostas is concerned about the roads, about their cheese production, about the chapel they want to build on the rise. Another young man sits to the side, warming his beans on the fire. He speaks to me in English and I discover he is from Afghanistan, but escaped when he was thirteen. He spent time in England then came to Greece, to Crete. As is the custom, we are offered raki and Kostas and Giorgis settle into the whisky. Eleni asks Irini if she can show me the cheese store in the mitata, and takes the century old key. With the girls we have to crawl through a narrow entrance. Once inside we behold a space accommodating at least a hundred (at a guess) rounds of cheese, each bearing the markings of the sieves that they have set in. Some are moulded; some fresher and younger. 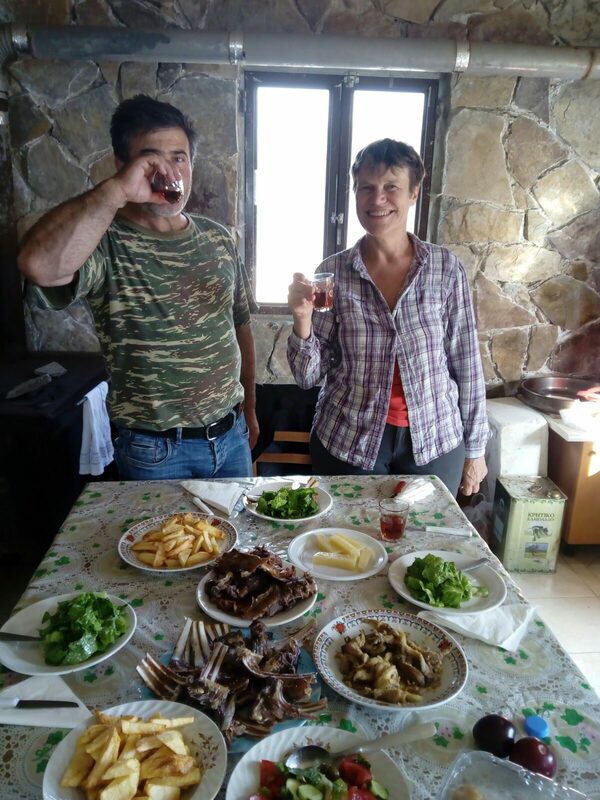 Eleni is helping Irini’s community in the steps required to be able to sell the cheese commercially. Back to the main dwelling and Kostas is in full flight discussion with Giorgis; it enables me to take some more photos. 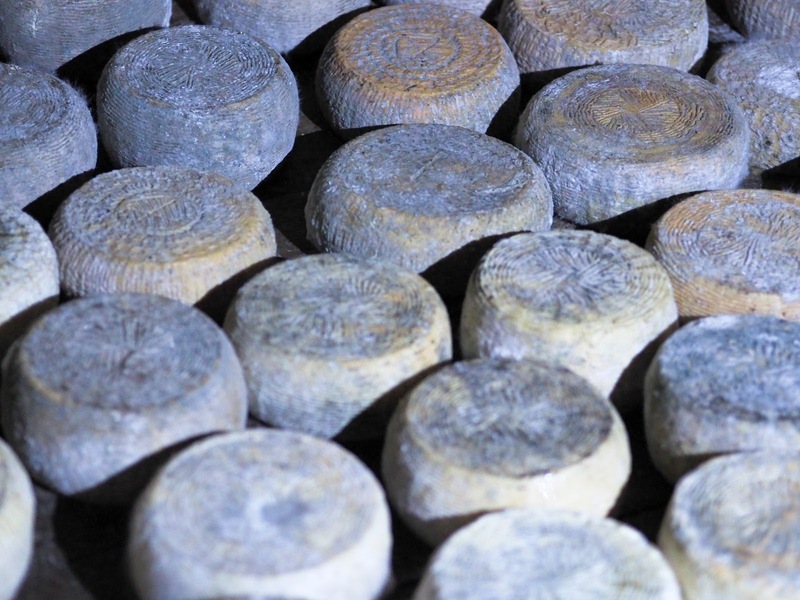 On the walls there are holy icons and high on the shelves are old cheese sieves made from bamboo. 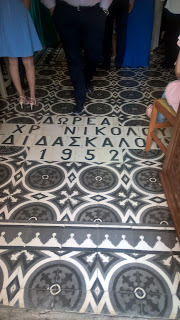 Irini does stone engravings and paintings, she shows us some of her creations that will decorate the chapel. It is time to return – we travel by clear moonlight over the rough ground. A long day and possibly a mountain climb tomorrow, though Giorgis is doubtful. Full of contemplation of the mystery of another world, centuries away from me, I sleep deeply. The fog appears to have lifted in the morning and we can see all the way down through the many blues of the sky and sea to Agia Galini below. But the weather will worsen, Giorgios advises, so better not to take the risk. Change of plan – we will descend, with the possibility of accessing the mountain from the Northern side tomorrow - and visit other spots relevant to my novel. We farewell Giorgios, but only for the day – Eleni had been enquiring as to the possibility of taking me to a Cretan wedding. Incredibly Giorgios knows of one happening that very night (unusual for a Thursday) in a village in the Amari Valley. But is it a problem that a stranger will be attending? With over 1,000 guests expected, I will hardly be noticed, Giorgis explains. 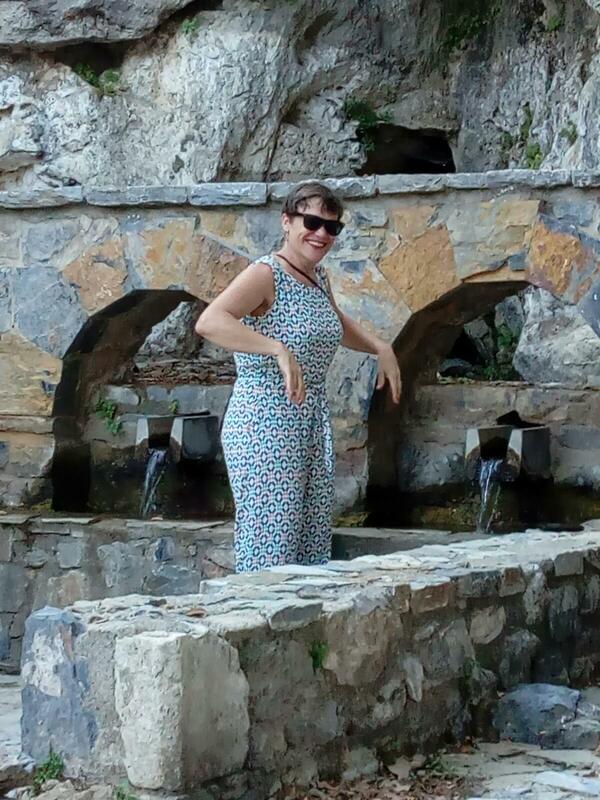 Agia Galini is appropriately tacky for the purposes of my novel. It is fun discussing plausibilities with Eleni. Where does my protagonist meet Captain George and his goat? is there really a bus that goes to Heraklion? What size are the boats in the harbour? We continue on; Eleni has prepared a picnic lunch that we enjoy in a grove of 2,000 year old olives, with the view of Psiloritis ever before us. 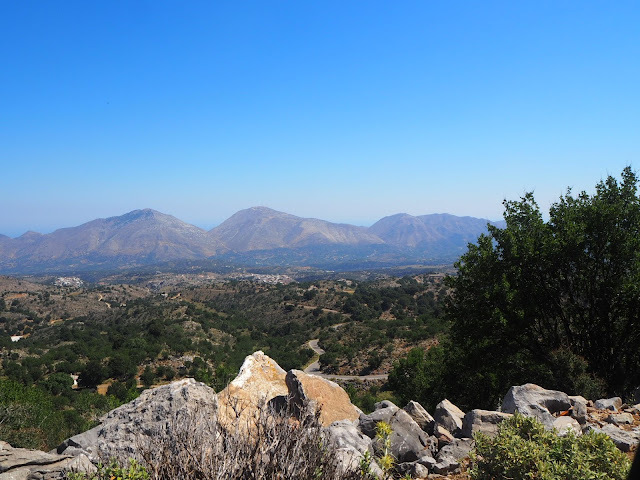 Then, a stopover at a lovely mountain resort in Gerakari, a now peaceful village in the Amari Valley, but in 1941 razed to the ground by the Nazis in retaliation for the Cretan participation in the resistance and the famous kidnapping of General Kreipe. Trying to put this atrocity aside, I anticipate a relaxing bathe in the pool, a hot shower and a rest before the big event of the evening. We meet Giorgios half way and travel on together. We make a stop to film some goats clanking and duelling and generally raising havoc. In the bride's village, crammed with cars, I stop to pick up a bullet shell on the road. Ah – Eleni tells me. When the bride leaves for the church they fire in the air. She seems concerned – are you afraid of that? I tell her as long as I can take cover (!) the experience will probably find its way into the novel. I peek into the church – so tiny and certainly not capable of holding the quantity of invited guests. 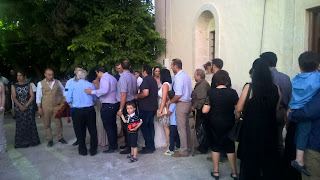 Half of them will go straight to the reception, Eleni explains, so there will be two lines of greeting and two opportunities to bestow the traditional gift of money. 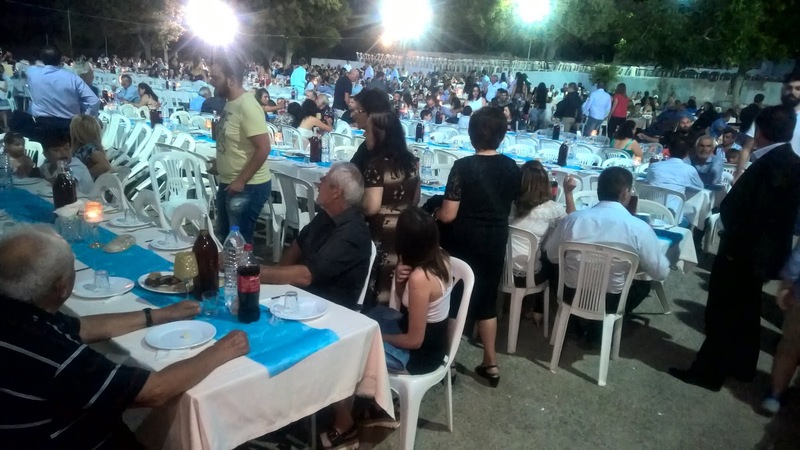 I calculate 1,000 guests at approximately 50 Euro a head. Enough for a small deposit on a house? It is a perfect evening. Soft summer light settles on the ancient stonework. Most people sit chatting in the courtyard outside the church. Eleni is pleased to encounter an old school friend. Sure enough, at a given moment I am startled by a loud volley of gunfire - a group of men, in their black shirts and Cretan headscarves, take turns to show off with rains of fire. There is actually a billowing of orange flame that accompanies some of the shots. Later I ask Giorgis what sort of guns. Kalashnikovs, he says without hesitation, and a Luger, a Thomson, a Beretta, a Zastava and a Browning, a Smith Wilson - there are a lot of guns. It is not strictly legal, Eleni explains – but what police officer is going to confront a band of Cretan men fired up - literally speaking – at a local wedding? I was told 1,000 guests but I am still astonished to enter the outside area of the taverna honoured with the task of feeding such a crowd. There must be at least fifty long tables of twenty places set. We take a seat opposite some friends of Giorgis, though Giorgios hardly has time to settle to his meal as he greets just about everyone who walks in. The main course is lamb, tender, slow cooked in lemon and accompanied by a delicious risotto made from the juices. The waiters bring bowls and meat out on huge trays. Salad to follow. Then the music starts up – a semi circle of musicians with traditional Greek instruments – the lyra, the bouzouki and more. The bride greets them all and garlands them with a Cretan scarf. I get up to try to film it - then find my way back to my seat, dizzy with the excitement of it all. One of Giorgis’s friends throws a scarf around my neck – welcome to the country! A shame we cannot stay until the wee hours – for it looks like it will be possible to climb the mountain tomorrow, and I need to claim at least 7 hours sleep. On the drive home we are all in good spirits – it has been a wonderful and unique experience. I ask Giorgis, through Eleni, if he knows of a taverna owner with rent rooms on the southern side of the mountain, someone who might be that character in my novel, who might offer safe haven to my two protagonists as they stumble down the mountain. He thinks for a minute. He doesn’t know of any tavernas in the small towns on the lower slopes. Wait a moment, he says. ‘That person is me!’ It’s true, Eleni says. Giorgis is always being called out to rescue lost and stray hikers, sometimes even in darkness. More often than not, they end up at his place, as there is nowhere else to stay! I tell Giorgis he has earnt a minor part in my novel. The talk turns to goats again and I tell them of the play I will see on my return – the Edwin Albee play, The Goat or Who is Sylvia – about a man who falls in love with a goat - and there is much laughter. I am warmed by the thought that we share the same humour, if not culture and language. 12.30 in the morning and I fall, exhausted, to sleep. Breakfast at the hotel is a smorgasborg of Cretan specialities from the region - sour cherry cordial, Cretan omelette, cheese and spinach pies, honey and yoghurt, fresh eggs. Unfortunately, I can’t fit it all in. I am over-ready with boots, daypack, walking sticks, jacket, chocolate. We meet young Giorgios at Arkadi – the monastery I have visited before, gracious in its peaceful setting today but scene of a tragic sacrifice in 1866 when Cretan civilians were unwilling to yield to their Turkish oppressors. Young Giorgios is an excellent guide, knowledgeable and friendly, full of attention to the smallest detail, and especially to my comfort as a woman twice his age about to make the ascent up to 2435 metres. Like Eleni and Giorgios senior he is similarly open minded and generous of spirit. We drive to the northern side of the mountain to access the path via the high mountain towns of Livadia, Zoniana and Anogia. The tough men of this so called ‘devil’s triangle’ have a reputation of holding out against the law and of skirmishing with the authorities trying to police the illicit cultivation of marijuana in the secluded areas. All of this is critical scene setting and plot set up for my novel, to which Giorgios contributes with his close knowledge of the region. There is plenty to discuss. We pass a female grouse and ten little chicks on the road, scurrying up the hill, too fast for a photo. We stop at a stone refuge, still being constructed, and ask the labourers to take a photo of us as we set off. Giorgios sets a steady, slow pace before me. 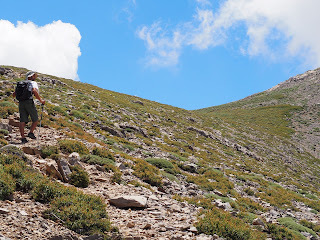 The hike is, of course, hard going but the temperature is perfect – no wind. Within ten minutes of starting. we stop to view a golden eagle, Giorgios thinks, wheeling majestically over the slopes. 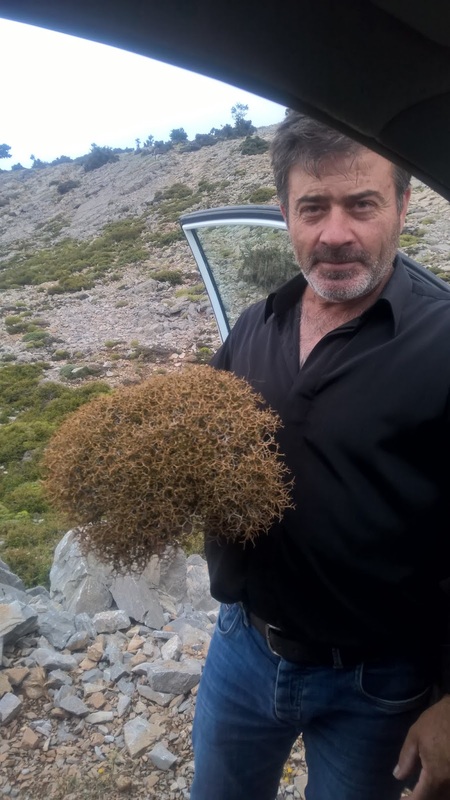 Giorgios finds and explains the fauna – little hardy alpine flowers, buttercups and violets and tiny things growing in cracks. It is steep – of course it is steep! Three hours up. 600 metres to the saddle and then a more graduated slope (at least, Giorgios promises) to the summit – if we make it before the clouds roll in. And we do, almost, make it to the top but Giorgios is wary of being caught in the billow of fog that is on its way, so we take our photos with the little chapel of Timios Stavros in the background – another half an hour across, but with no possibility of seeing the four corners of Crete today. I don’t mind, really – the north eastern view is magnificent enough from where I stand – looking towards Heraklion and all the way down to the Aegean. It would be nice, of course to sit on that saddle and see the Libyan and the Aegean seas at the same time – but I am satisfied to have made it this far. The descent is excruciating, though, as my knee is troubled and the loose pebbles are treacherous. I survive, with one slip and a tumble, my hand landing on a clump of prickle bush - ouch! By the end I am hobbling like a hunched old Greek woman. But it is a triumphant photo that the workers take once we get back to our starting point. We are not yet done – there is Zeus’ cave to see, though the light is falling. We drive back through Zoniana where Giorgios knows of a local taverna for a celebratory Greek coffee. Metrio – with a bit of sugar - the taste takes me back forty years when this was the only coffee that was served. The woman remembers Giorgios from a mountain hiking group that used to stop here. She is curious about me – she knows Sydney. Soon, apricots and raki appear. She comments on my Cretan lace scarf from the wedding – and indicates that hers are better quality. I agree and happily purchase one from her. Onwards on the high and lonely road towards the Nida plateau and the cave. We pass no other vehicle – there is nothing here except sheep and goats, some of whom do not move from the middle of the road without quite some beeping. The sun drops in the sky, casting the mountains in austere, imposing majesty. I can’t help but think of the hot shower that supposedly awaits us at the Shepherd’s shelter where we will stay tonight, a complex based around a traditional mitata, lovingly built by another dominant character in the region, Papandreas: shepherd, builder extraordinaire and a man who also doubles as a priest. The road seems long and my knee is aching. A sign indicates there is a further 1.5 kilometres to walk (upwards) to the entrance. I am determined and try to ignore the pain. We set off, though I wince at every step. It turns out there was a road that we only see when we arrive at the top. Giorgis returns to get the car, ever attentive to my pain! But when I finally stagger to the grilled entrance, I see it is closed. There are no opening times advertised, so we couldn’t have known. Like I said – I am determined. Despite my knee, I see a way of climbing up and over the barrier and I am there! At the legendary cave, very sacred for the Greeks; a number of relics from Minoan times, even, have been found here. I view the large entrance to a cavern, watch the swallows flit in and out, and my voice echoes. I have no inclination to stay long, with the lure of the shower and dinner foremost on my mind. But also – it feels isolated and lonely. Unlike my protagonists, who have to spend the night here – I will be warm and comfortable tonight. But Giorgios regrets to tell me - he is not sure there will be a shower. Certainly, no electricity - that requires the generator. Papandreas has been called away and will not be there to greet us – nor are we sure he will be there in the morning. There may not be breakfast. Is it worth it? Perhaps I should return to Rethymo to seek a bland, boring hotel bed – but with the possibility of a shower. 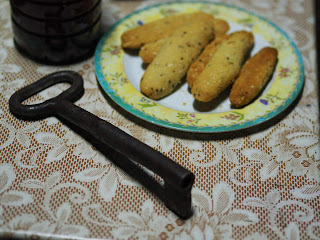 As it is so late, we decide to think it over at a taverna instead of buying food to prepare. We stop for a delicious souvlaki, salad, pita and heavenly mizithra in Anogeia, hopping with evening energy and life. I am decided; I will forego the shower and we continue on to Papandreas’ shelter, just out of the village of Krana. The chance of meeting this charismatic shepherd is worth much more than a hot shower after a six hour mountain hike! There is a washbasin and a clean toilet. We put our mobiles on flashlight and Giorgis finds the headtorches. He makes up a simple bed on the couch, with clean white sheets. 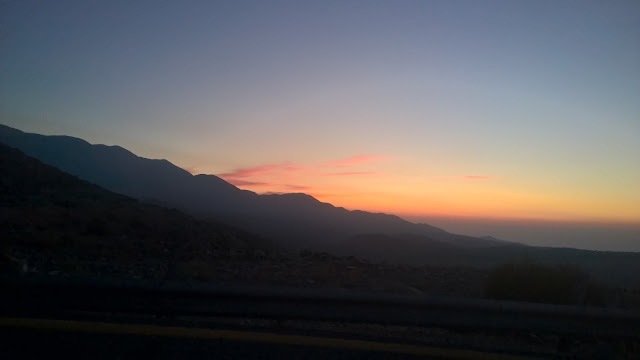 We open the window to the clear mountain breeze and after a scan of the starry sky and a glimpse of the silhouetted constructions, I fall into a comfortable and grateful sleep. We are woken next morning by the sound of a truck. Papandreas starts early, there is much to do. Papandreas has to keep moving but I manage to get a photo that I think will go viral, of him milking the sheep – the ewe upside down and inelegantly pulled though Papandreas’ legs so he can squeeze the milk from the teats into the bucket. It takes about thirty second per ewe - they don’t seem to mind! He takes us to the mitata, beautifully constructed, yes, for the tourist market but authentically and expertly done - it is an awesome monument to the hard work of Papandreas and his sons. There are wood ovens and a lamb spit, a proper milking set up and pens for the goats, a quarry, long stone benches, herb beds, sheep and goat pens. Of course there is breakfast! Papandreas pulls out a graviera and an anthotiros, (a softer, less mature cheese) and finds us apples, tomatoes and honey. Giorgis makes an excellent Greek coffee and once again, I don’t regret my decision. I laugh, warm with the feeling of welcome that I have been lucky to re-experience - after almost forty years - in this most generous and hospitable of places. 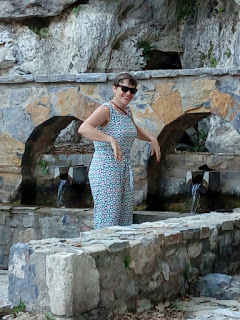 Eleni and her team are trying to do something very special - challenging and very authentic: tourism where you really connect with locals and see the world through their eyes. It is a fond farewell to Giorgios when he drops me to the bus station at Rethymno, where I will board a bus for Chora Sfakia on the South Western coast of Crete. I will join my writing group in the little fishing port of Loutro and complete the next stage of my novel – incorporating these unforgettable experiences with Eleni and her shepherds on the mountains of Crete.